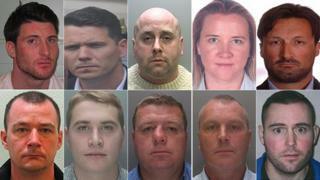 A former suspect in the Stephen Lawrence murder inquiry is among 10 British fugitives named as the most wanted in Spain. Jamie Acourt, wanted on suspicion of conspiracy to supply cannabis, is among one Scottish and nine English suspects, the National Crime Agency (NCA) said. It comes after the agency warned the UK may lose access to vital European intelligence after Brexit. The Operation Captura list marks 10 years of tracking fugitives in Spain. Since agency operations began, in conjunction with Crimestoppers, 76 out of 85 people have been apprehended. In the latest list, fugitives are also wanted on suspicion of murder, child sexual exploitation, and drug trafficking. Steve Reynolds, head of international operations for the NCA, said: "The fugitives we are hunting are wanted for serious crimes and must be returned to the UK to face justice. "Many of them use Spain as a base to continue illegal activities which still have an impact on the UK, but it is not a safe haven." He said that as Brexit negotiations take place, unless the UK renews its membership of Europol - the EU crime fighting agency - by the end of the year, such operations could be compromised. "Europol is extremely important, the European Arrest Warrant is extremely important," he told the BBC. "But, we would be interested in replicating those bilaterally if the Brexit negotiations resulted in us losing those links." Lord Ashcroft, the founder and chair of Crimestoppers, said the suspects were evading justice. "We know that with the help of Spanish authorities, along with the public in Spain and the UK, we can find these people," he said. Simon McGuffie, 41, originally from Liverpool, suspected member of a Merseyside-based organised crime group involved in the large-scale supply of cocaine, heroin and cannabis across the North West. Crimestoppers and the NCA work with the British Embassy in Spain and police forces in both countries. Simon Manley, British Ambassador to Spain, said: "Captura is one of the best examples of the fantastic collaboration between Spanish and British law enforcement. "I would like to congratulate all those that have worked over the last 10 years to bring fugitives to justice."